Get Math Help for Your Struggling Student Now was made possible with a year long Homeschool Membership from CTCMath for review as part of the Schoolhouse Review Crew. Ah, math…a subject so lovely with its order and beautiful in the different manipulations you can do. Alas, not everyone agrees with my vision of math as a wonderful subject with so many application in life as well as just being plain fun at times. With the strong biases towards math out there, it is no wonder that people are looking for help. Parents, whether they homeschool or not, may feel a bit ill equipped to help their child master the necessary skills. Thankfully, there are options out there to help you whether you are looking for a complete curriculum or something supplemental to take the place of a math tutor. CTC Math is an online, subscription service offering course options from the kindergarten level to high school calculus. You can use it on a computer or iOS and Android devices with a modern HTML5 platform. From the parent account, you can easily manage your student or students. There is a choice for a single student plan or a family plan for up to 10 students. As we have fewer than 10 children, I used a student slot for me. This allows for my own refresher on advanced math. Each student has their own log in information to enter the student portal. And a new feature is that students can customize the color of their theme. I recognize that my boys like to put their own ‘stamp’ on things and this customization is enough for them to have that personal experience with CTCMath. We have used some online math programs which were priced by the level. For some students, that might work well. But if you have one who goes through math quickly OR a struggling student that needs a refresher from an earlier grade level’s concept, then you are out of luck or forced to pay extra. With CTCMath, you get unlimited access to all lessons, across all grade levels. So there is no worry if a child moves from one grade to the next before your subscription ends. Just have them move to the next level and keep going! For grades K – 8, CTCMath can be used as a full curriculum. For that approach, you will want the child to progress in order. So they would start at the first topic and make their way down the list. If it is being used as a supplement , then they need to find the appropriate topic where they need the extra help. As the ‘teacher’, you can assign those particular topics as tasks to for the child. The task feature in CTCMath lets you set an assigned date with the due date automatically the next day. Then select the student for the task. With courses by grade level through 6th grade, a bridge section for middle school, and high school level classes including calculus, there is math help available to pretty much any student (and parent!) currently struggling. Regardless of whether this is a core curriculum or supplement, the mechanics of using CTCMath are the same across the board. Step 1: Log into the student account and then go to the appropriate course (e.g. 1st grade or Algebra I, etc.) There you can find the topic they need for that session. Step 2: Watch the tutorial video for the particular topic. In each video, instructor Pat Murray explains the concepts and procedures while the screen shows graphics and animation visually bringing the problems to life. The total video length tends to be between 4 and 9 minutes. A one-page summary of the tutorial can be printed for reference and review. 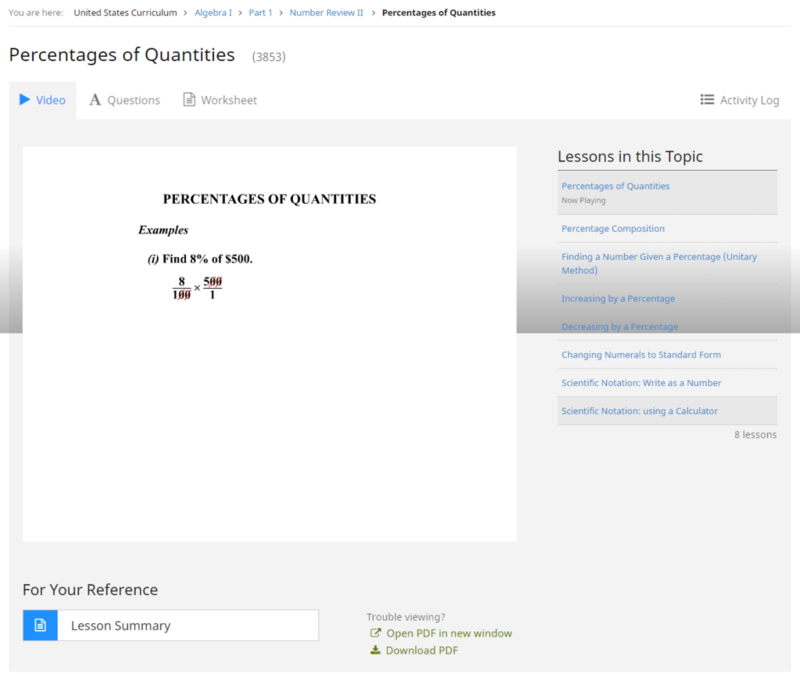 Step 3: Answer the interactive questions and/ or an optional printable worksheet to see if they understand the material or need more work. Step 4: Look at the solutions for all problems you missed to understand where mistakes were made. These are viewable after the answers have been submitted. Each step needed to solve the problem is shown. Results are stored in the system and a child can go back and try again to hit whatever minimum the parent has set for a passing grade. The default is 80% for passing. The parent can change that to be higher or lower. NEW to the program is a parent/teacher’s ability to reset results for lessons, tasks, diagnostic tests and speed skills. You have to enable editing on the particular component you wish to change and then red boxes with an x in the center will appear. Clicking on one of them will reset that particular component. Does Our Family Find CTCMath a Good Resource to Get Math Help? I will share that the only difficulty I have with this online subscription is the need to closely monitor the boys. That usually equates to them working on CTCMath while I am in the same room and able to verify they are actually working. Maybe it is just my boys, but I find that those electronic devices can quickly go from wonderful learning tool to a source of tempting distractions. This is a USER issue rather than a problem with the program. I find the same issue with any online program and adjust when and where they are working. Even when I am acting as ‘monitor’ while they are working, I do not always have time to double check everything the older boys have done. My youngest son usually wants to show me what he’s accomplished. Sometimes, the same son needs me to be quite present and I see the whole lesson. As I don’t see it all ‘live’, I greatly appreciate the weekly summary email showing what each registered student has done in the previous week. This feature helps make my busy life a little easier. Overall, this remains one of our family’s favorite math resources. It can be used by homeschool and non-homeschooled families with kids that need a bit of extra help with math. 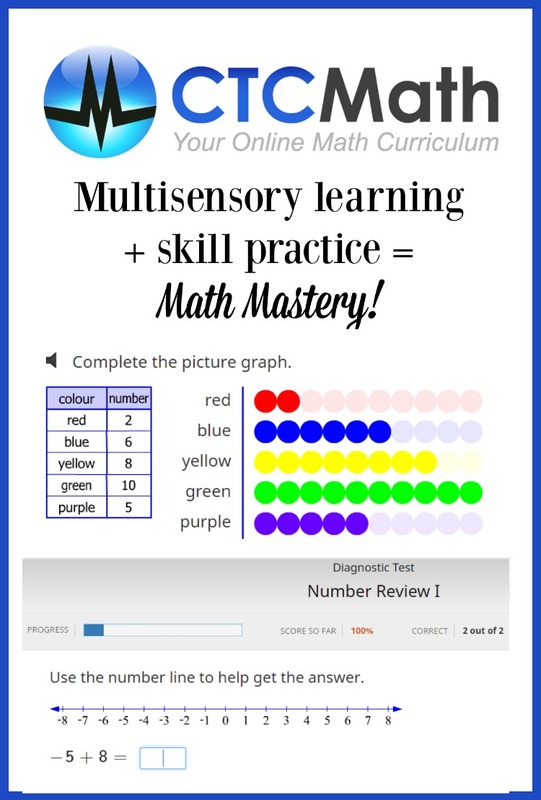 Multisensory learning + skill practice ==> math mastery. This math junkie is more than happy to turn over the reigns and see the boys succeed with everyone having less frustration in the process. Do your children enjoy online learning opportunities for math? Would this program appeal to you and your family? Don’t just take my word for how we found this to be. Visit the CTCMath post on the Schoolhouse Review Crew website to see what other homeschooling parents thought about this title and other grade level ones.